It has begun! Our expedition to the Tunnunik impact structure on Victoria Island, Northwest Territories, has begun! As I write this, the first wave of travellers has left London, ON, with a two-pronged approach via Yellowknife and Ulukhatok in the west and Ottawa-Iqaluit-Resolute Bay in the east. 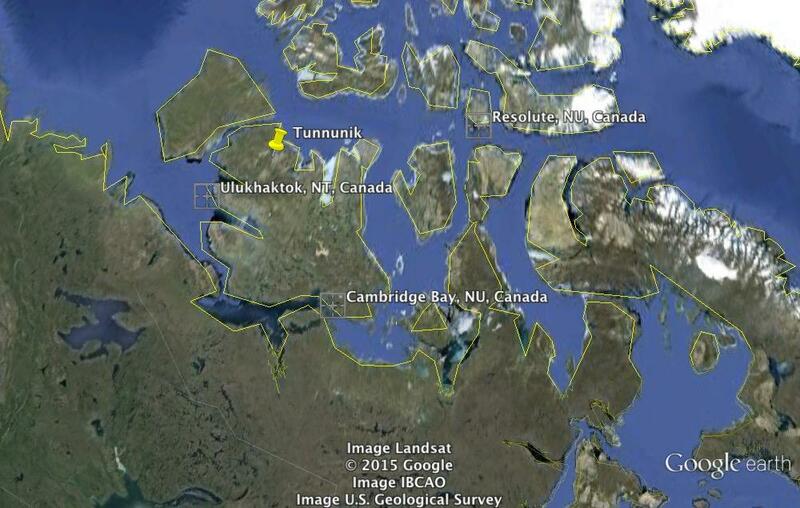 Our destination for this expedition is the 28 km diameter Tunnunik impact structure near Collinson Inlet in the northwest of Victoria Island (see Google Earth image below). This is Canada’s most recently discovered impact crater. Two geologists, Keith Dewing and Brian Pratt, first discovered Tunnunik in 2010 and published a paper on it’s discovery in early 2013 in the journal Meteoritics & Planetary Science. Before this, I led a reconnaissance expedition to this site in July 2012. 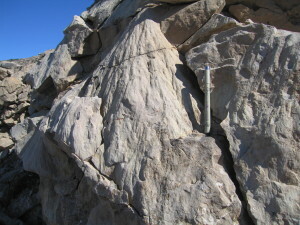 We found more than enough of interest – including some of the best shatter cones I’ve ever seen (!) – to warrant a return expedition. Fast forward to July 3rd 2015 and the long voyage to Victoria Island has begun! Indeed, our trip from London, ON, to Tunnunik, NWT, will take 4 days (if the weather cooperates), which is longer that it would take to get to the Moon (in a rocket of course)! – PhD student Cassandra Marion is investigating the hydrothermal system generated by the impact event. Cass is returning for her second trip to Tunnunik. – PhD student Jennifer Newman, who just started her thesis in May 2015, is going to be mapping the crater, investigation the impact breccias we discovered in 2012, and looking at the structural geology of Tunnunik. – PhD student Byung-Hun Choe and Research Scientist Livio Tornabene are ground-truthing interpretations made ahead of time based on Radarsat-2 data and other remote sensing imagery. This forms part of a Canadian Space Agency (CSA) grant “Application of RADARSAT-2 polarimetric Synthetic Aperture Radar (SAR) for geological mapping and resource exploration in the Canadian Arctic“. – MSc student Taylor Haid will be collecting lidar data of various sites as part of his thesis which is focused on the use of lidar for geological fieldwork. – PhD student Jean Filion has developed an ipad-based app – as part of his PhD in Electrical and Computer Engineering – that allows geologists to take notes, photo’s and document samples, which we will be putting to the test throughout this field expedition. – Undergraduate student Racel Sopoco will be a field assistant and will be collecting data for her undergraduate honours thesis. – PhD student William Zylberman – a co-tutelle student jointly at Western and Aix-Marseille University (AMU) in France – will be conducting various geophysical investigations of the structure to explore the sub-surface structure. William will be joined by Jerome Gattacceca, Yoann Quesnel, Pierre Rochette, and Minoru Uehara from AMU. – And last but my no means least, we are joined again this year by Canadian astronaut Jeremy Hansen, who will be immersed in our expedition to receive field geology training and, as noted by the CSA “by doing field work in remote or “desolate” environments on Earth, astronauts can train for the kind of rigours that will await them on planetary bodies”. This year will mark the 5th summer in a row that Canadian astronauts have accompanied us on our expeditions to various meteorite impact structures in the Canadian North. Details of previous expeditions can be found here.